Can Music Predict The Election? The question on everyone's mind: who will win the swing states? The political machine is well equipped with sophisticated forecasting and modeling tools to predict voters' behavior. Complex algorithms huff and puff in data centers twenty-four by seven. This article introduces an innovative lens to look at the elections: through the study of voters' musical preferences and affinities. A social music company called Smule ran an insightful experiment. They put the 900 million songs in their database through rigorous analysis, correlating the musical tastes of users with "red" and "blue" states. The results were illuminating. "Our musical tastes are just as polarized as our country!" says Jeffrey C. Smith, Smule CEO and co-founder. My interest was piqued, and I sought to learn more. For background, the company's products allow anyone with a mobile device to play, sing, and create their own version of songs. "Smule is about expressive music-making and the creative output of individuals and populations," adds Dr. Ge Wang, Smule co-founder and Assistant Professor at the Center for Computer Research in Music and Acoustics (CCRMA) at Stanford University. Let's first take Gimme Shelter, a Rolling Stones classic -- and a personal favorite of President Obama. Crunching the numbers, Smule found that Gimme Shelter is played twice as many times in blue states, than in red states. 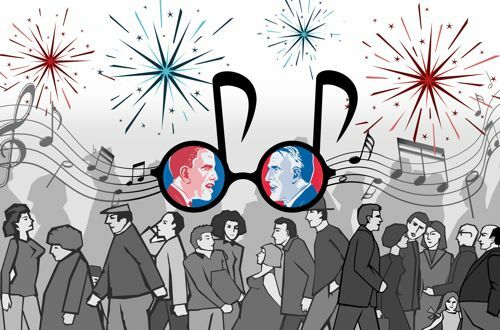 Can music give us insights into voters' preferences in the swing states? For this Smule tested Free Bird, a broadly appreciated song by Lynyrd Skynyrd. The song proved to be neutral -- and was equally played in red, blue, and swing states. •	Ohio, Florida, Colorado and Iowa showed a closer musical affinity with the red states. •	Nevada, Virginia, Wisconsin, North Carolina and New Hampshire were more closely aligned with the blue states. 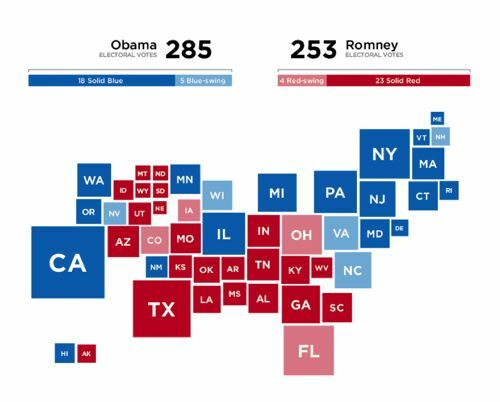 Linking states to electoral votes, Smule concluded that Obama will win the election, with 285 Electoral College votes to Romney's 253. We shall find out on November 6th if Smule's predictions are accurate. Nonetheless, their analysis offers a novel and insightful perspective on the election and voter sentiment. As the great Persian poet Hafiz said: "Art offers an opening for the heart. Art is, at last, the knowledge of where we are standing in this Wonderland, when we rip off all our clothes and this blind man's patch veil, that got tied across our brow". It's time to tap into and cultivate art insight, to deepen our understanding and expand our potential, as individuals, as politicians, as corporations, and as nations.